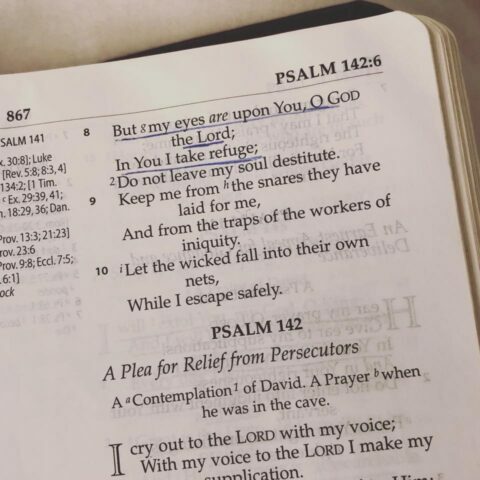 “But my eyes are on You, God…” Psalm 141:8. We can see so clearly the humanity and heart of David in this phrase. He faced battle after battle yet turned his eyes upon the Lord. I think all of us can relate. Yes?! I feel rejected, but my eyes are on You. I feel lonely, but my eyes are on You. I feel confused and unsure, but my eyes are on You. I feel like I’ve messed up too big this time, but my eyes are on You. I am not good enough, but my eyes are on You. I can’t seem to move forward, but my eyes are on You. That person that rejects you, the job offer that never came through, the relationship that failed, failure on your part with something that seems huge…NONE OF THOSE THINGS CAN BE OUR REFUGE. I know. I’ve tried. And for some reason I find myself still trying at times. But I know, as soon as I TURN MY EYES UPON JESUS that my true peace comes only from Him. And He will never reject you, leave you alone, or decide to not forgive. His grace is sufficient. His mercies are new. He is faithful. He is our refuge.